Did you make your own cutters? I did. 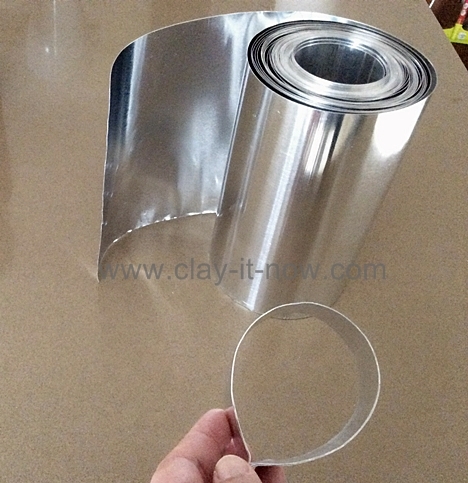 I spent $15 to buy thin aluminium sheet at my local hardware store. I've made couple of clay cutters by now. Later on I realized that we can actually use recycled material from soda can drink, can food and plastic bottle to make DIY cutters. 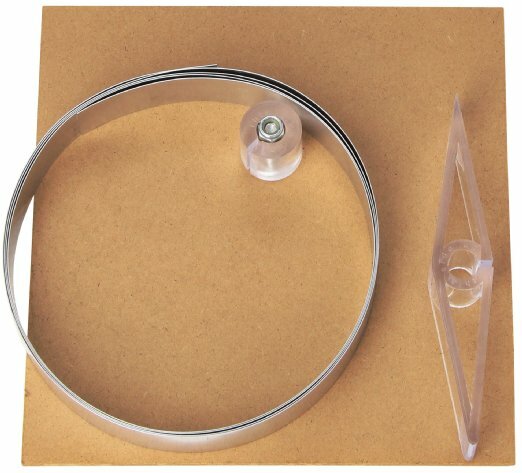 But if you are not sure, just buy cookie cutter kit for your DIY cutter. 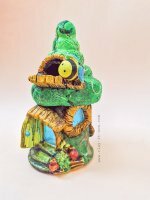 I've made mine following tutorial by Rubina Sattar from Gemini Art and Crafts. Tools and materials: thin aluminium sheet, scissor, pen, ruler, steel bond/ superglue, clipper, wooden block. Hammer two size nails on the wooden block to shape and curving the aluminium sheet. Cut the sheet to about 1 inch wide and cut. Draw the line in the center and fold the sheet in the middle. Make a pattern of leave or petal of your choice and use thread to measure the outer length of your diagram. Cut the thread and use it as a guide to determine the length of your aluminium stripe. Mark the length and add about half inch. Apply steel bond or superglue at the end of the tin stripe, overlap and join both ends. You'll see the stripe became a ring shape now. Squeeze the ring to form the leave shape or petal. 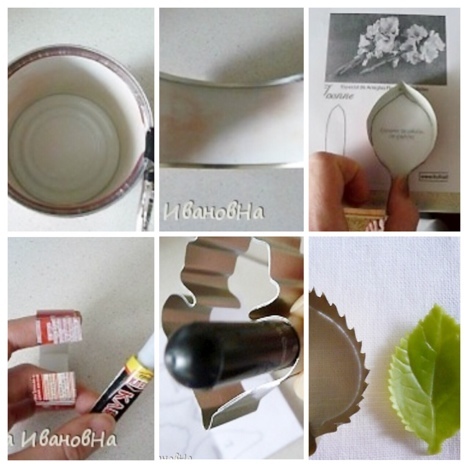 For more detail instruction, you can visit Rubina's blog, homemade cold porcelain cutter making. 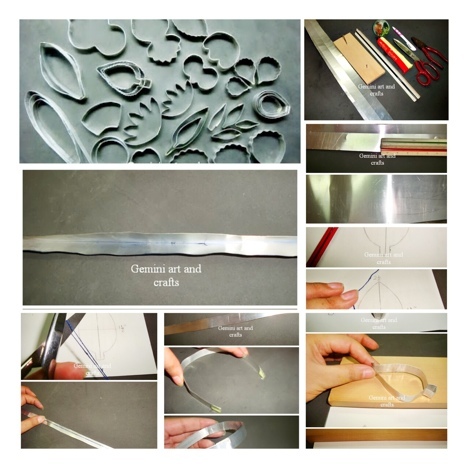 Ivanovna's tutorial for flower petals and leave cutters is my favorite. She uses recycled tomato paste can. Cut the bottom part of the can and open it up to form a thin sheet. Make a stripe to about 1 inch wide. Choose the petals or leave diagram you like. Place the stripe on the diagram and cut the balance of the stripe that you don't need. Use superglue or hot glue gun to join both ends. Hold it for few minutes. You can use laundry clip or paper clip to keep the join in place until the glue dry. That's all. It's ready. In her website (in Russian), she also show us how to make ruffles. And she has template for flowers such as carnation, gladiolus, clematis, poppy, orchid, passion flower, rose, hibiscus and iris. 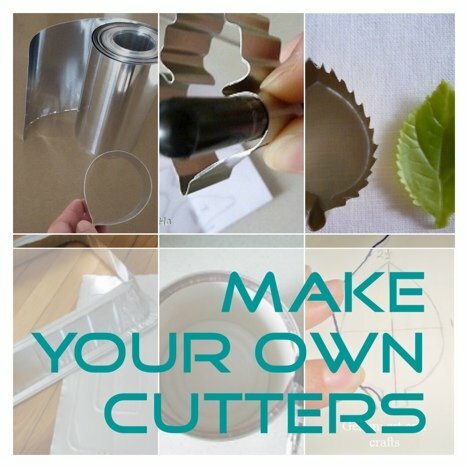 Are you ready to make your own cutters? Do you have different method? Would you like to share with us? Please go to this page.